I woke up yesterday to some disturbing headlines about the financial crisis, climate control and the fact that tuna is supposedly the 'new chocolate' (yes, you read that right - as if life isn’t hard enough). Not only is the economy in meltdown but apparently the cost of climate change “will haunt humanity until the end of time". According to some know it all scientists (ok, they do good things for the world but this time they have gone too far), we Australians will be forced to eat kangaroo in the longer term as beef and lamb will be in limited supply and reserved only for the very wealthy. For most of Australia's human history - around 60,000 years - kangaroo was the main source of meat and the experts think that we should now get rid of our 20 million sheep and 7 million cows and replace them with 240 million kangaroos. This is all thanks to a special report commissioned by Greenpeace which claims that Aussies can dramatically reduce their carbon footprint by eating less beef and more of the local wildlife. And now everyone's suddenly getting over-excited about kangaroos. Why? It's all because they don't err, break wind. Or, to put it rather more scientifically, whereas cows and sheep release vast quantities of methane through belching and flatulence, kangaroos release virtually none. Not only are they cute but they are model livestock apparently. I can see all our farm animals committing hari-kari over this announcement. And to think all I wanted was a Friesian cow, just one lousy cow to call my own! I can just envisage the cow police calling on me looking for Fanny Mae (my cow to be) under the bed or behind the couch and taking her away. Who would have thought that pet cows may soon be prohibited? I am turning vegetarian. That has to be a better way to save the planet. And our kangaroos. I will NOT eat Kangaroo. And I'm not going to throw a kanga on the barbie for anyone. The fact it was only legalised for human consumption in the mid 90s says something don’t you think? And I don’t care that it is high in protein and low in fat - so is spinach. Alright, I confess I had a taste, ONCE. But it was years ago when I was young, foolish and easily led (I am now older, foolish and easily led). It was a dare and I had to have three stiff drinks in a row for courage. The meat was dark, chewy and horrible. Worse still, for my punishment, I had horrific dreams that I had eaten Skippy, the Bush Kangaroo . One minute, Skippy was bouncing happily through the outback, ears flapping, tail flopping, without a care in the world. Happy. And the next minute, he’s on my plate and I am eating him without a care in the world. Happy. That’s a lot of guilt to carry, let me tell you and it will haunt me until the end of time. I think eating kangaroo is about as disrespectful as eating your mother’s pet cat. And I don’t mean that disrespectfully. The Kangaroo is our national emblem. It’s image is on our coins. No, it’s too horrible to contemplate. I don't care that Europe is mad for kangaroo. They don’t know what they are doing. Besides they probably think skippy is just a piece of meat lying on a plate covered in exotic sauce and accompanied by root vegetables. Here, we once sang about him as 'our friend ever true'. The French eat it in steaks. The Belgians like a nice bit of fillet. The Germans are partial to a warming tail soup and the Russians are particularly partial to sausages - so partial that they eat more kangaroo meat than anyone in the world. Cue depressing music. I think a little Leonard Cohen and a big piece of chocolate are called for. I have lost the bounce in my step. And, as for tuna being the new chocolate, arghhhhhhhhh!!!! So tell me have you or would you eat Kangaroo? Or have you eaten something that is not usually found on the standard menu? Update: This video features the Skippy theme song from the TV series and is especially for Rene from Not the Rockefellas - may you hum this all weekend! Can you just see people sprinkling tuna on their cappuccino? And I'll just have a glass of tuna instead of Ovaltine before I go to bed. Skee pee the bush kaan gah rrooo. No, I've never tried Kangaroo. It's just too damned adorable to consume. I remember that show, Skippy the Bush Kangaroo, played here in the US right around the same time as Flipper, I think. This is hilarious. No, I would not try kangaroo. I have seen episodes of Skippy too in the UK. Wasn't it made in the sixties? I wonder what the scientists will recommend we eat here, another extinct species called the Royal family perhaps? Funny post and I think going the vegetarian route is the way to go as much as I like a steak every now and then. Spinach just isn't the same as a good steak Lilly. I am also going to start hoarding chocolate. There is nothing on this earth that could replace chocolate. NOTHING. L. M. A. O. I kid you not. I busted out laughing so loud and so hard that Greg came running in here, demanding that I read outloud your blog! That was hilarious! Especially the part about Mom's pet cat. OMG. I have tears in my eyes. I've tried alligator - taste like chicken. And as for chocolate ~ I DARE someone to take chocolate off the market... do you know many woman around the world would PMS at the same moment?! Thanks for the laughs, Lilly. This was great! It's even beyond my comprehension that it is possible to eat kangaroos. It's so cruel. @ Not the Rockefellars - yes, Flicker, oh I so loved Flicker and you are so right Kangaroos are too adorable - its horrible. Thanks for dropping by. @ Sarah - save me some chocolate won't you - I love a certain chocolate shop over your way. @ Aleta - so glad I made you laugh. You have tried alligator? At least the meat looks better. Nutria, I had to google them - oh dear I guess if it helped with the culling but oh dear. Yes seriously this article was trying to say that people will look upon tuna as the new chocolate - like how? There is nothing sweet about tuna - or not the type I eat anyway. @ Lenno_cornish - I know what you mean and agree. Thanks for dropping by my blog. Seriously, though. You can always tell who "commissioned" (paid for) a scientific report by what its findings are. In my CONSIDERED opinion, Greenpeace and Friends of The Earth (there's a misnomer if ever there was one) are directly responsible for a large part of the problems and misery we have in the western world today - caused by their past actions that mostly achieved the direct opposite of what they intended, if anything at all - hell, THEY and their ilk are probably actually RESPONSIBLE for global warming (if humans have anything at all to do with it). However, it is a fact (and probably the only the human race could actually do anything about in the long term) that the release of methane gas by cattle and sheep is the biggest cause of the so called greenhouse effect for which we are supposedly responsible - THIS has been known for years, but it didn't suit their "back to the land" daft ideas to promote it - they'd prefer to ban cars and industry that have little effect, by comparison. I could read between your usual funny lines a certain sadness and disappointment and I concur. I don't live in Australia, but I think kangaroos are way to cute to be eaten! I suggest we eat the scientists that came up with the idea before they cook up more brilliant ideas like eating koalas and pandas on the basis that they could be going extinct. In Romania we eat pork, beef, sheep, chicken and sometimes game. I am ashamed of eating all of the above as I love animals (I adimit having eaten rabbit, and deer, but only once or twice). I have no excuse fot it, but this is how I was raised. I love meat, but I could do without. Besides, think of all the E components of food nowadays. I suggest the scientists come up with ideas to replace meat entirely. My first thought was "Of course I would never eat a cute Kangaroo! ", but I guess I do eat beef, pork and chicken and darn it if calves and piglets are cute!! (Sorry chickens...your still ugly). Maybe it's just because I've been predisposed that eating cow, pig and chicken is okay. I still can't quite get the stomach to think I'd eat Kangaroo. I'm pretty adventurous when it comes to food. I've tried buffalo, deer, alligator, rattlesnake and every type of seafood I can think of. I had the biggest problem with the deer. It didn't taste bad, but I had trouble getting past the thought of it. Fantastic, Lilly. This is my first time at your blog, but I'm definitely coming back. No, I don't think I would eat kangaroo. Actually I want to become a vegetarian, but I keep getting these cravings for tuna. . .
Lilly, I just needed to drop by and tell you that I have had the Skippy song stuck in my head all day long! Skippy, Skippy, Skippy the Bush Kangaroo! It is amazing how many people remember this off of the radar show. Oh My god Barbara, a spring in your step. If I couldn't stop laughing from your article, Now I have to pick myself up off the floor from reading Barbara's comment. I love it, what will they come up with next. There are times that I think our most intelligent scientists can be just so dumb. Never had Roo meat, don't know if I would try it or not. I have eaten elk, buffalo, deer, rattle snake, and a few others. I definitely would not eat nutria. And I never knew kangaroos didn't pass gas. In fact, I can hardly believe that I know that now! p.s. I've never seen a live kangaroo. I imagine them to be like deer, only "hoppy". Thank you for the vid and the most honorable mention! The song is embedded in my brain now! Maybe we could all sync up and sing it together one time in solidarity for the 'roo. **keeps hiding in the corner** ummm I like kangaroo, when I was still in Australia 11 years ago it was the main meat I ate, though here in Europe it is VERY expensive. Now I shall hide again. Tuna is the new chocolate..that gave me such a chuckle. Yeah, right! I don't like eating rabbit, and kangaroo seems along the same lines. Vegetables seem like a great alternative should we start to go hungry. I am absolutely torn by the Garnaud report - and your post makes it all even harder. I adore kangaroos but know they are multiplying so very fast in many areas of our land that they've had to cull them occasionally to allow some to survive! They are good for our environment because they don't produce the methane of cows et al, and move around leaving a soft foot/tailprint, unlike the damaging hooves of the introduced beef. There's no doubt that the atmosphere needs a hand. If eminent scientists say it's a toss up between the Barrier Reef and culling kangaroos sensibly for food, I'd have to go with Skippy (oh dear). I did taste kangaroo years ago when a hostess served it up and asked us to guess what it was. It was delicious because she'd cooked it for ages, with red wine. For a while there Coles had kanga mince and yes we made it into the same things we made regualr mince into - rissoles, savoury mince etc. P.S. Lilly -- Ooo, I just noticed that my blog is on your blog list! Thanks!!! When did that happen? No, I have never eaten Kangaroo ever and I never would eat any animal. I am a vegetarian and I am glad I don't have to make that decision. Tuna, the new chocolate? Oh, I will argue that one until the very end. I don't think I could eat a kangaroo for the same reason I can't eat deer meat. They are so cute. Good to know that kangaroos don't fart. You learn something new everyday. The reason why animal rights groups are against the slaughter of kangaroos is that the industry is not as regulated as it should be and the way these animals are slaughtered is questionable. I dont want to make anyone sick but the little baby joeys are often hit over the head because they are too young to survive if their mothers have been killed. I also understand areas of Australia where they are problematic and they need to be culled. I also guess that it is a good export but I think there needs to be more control on how these animals get from the land to the dining table. I wouldnt eat them. There are many kangaroos in the parkland near my house. No problems with them there. I will give up meat if it comes down to it and live on chocolate. "Chocolate. It's not just for breakfast anymore"
"Blue knows everything will be alright as long as there's Nutella". Nutella is just a perfect fallback chocolate for me. I buy it in big vats and sometimes bathe in it. But I don't think that even Nutella or Chocolate sauce could convince me to try some Kanga. Dipped, dunked or slathered in it, I still couldn't get it down. Or tuna, for that matter. It's in the "SeeFood" category (cleaver spelling aside...it's a ploy by the cattle/poulty industry to trick people by distraction), which is clearly in injunction to just LOOKIE, no EATIE the stuff. So I've always tried to follow that edict. So chocolate stays. In purest form. I'm glad you visited my blog and enjoyed my post. I agree...the things we go through just arm us with tools to help others. I'll peek around your blog now...having only read this latest post. I'm having fun getting to know some Aussies! Maybe someday we'll meet IRL. Lilly - wonderful storytelling, as usual. I would never eat kangaroo either, and I've never even seen one. They are definitely too much like a pet. I was at a restaurant in France once, where they only served "delicacies". I didn't eat anything too strange for most people, but a couple of the items were strange to me, i.e. goose liver pate, and sea-gull eggs (surprisingly good). I can't remember everything we ate, as it was many years ago, but it was an experience. I'm afraid I am not much of an experimental eater, I usually stick to the basics. I really enjoyed this story, thanks for always putting a smile on my face. Green peace wants this change because those animals "break wind". What? That's just silly. Can't they think of a more practical way to help the environment then taking peoples food away? I live in the U.S. and have only seen a kangaroo once, or twice in my life at the zoo. Therefore, I don't feel the same kind of attachment to it that you do. Yes, I would try Kangaroo. I see your icon on Mediterranean diet to my left. Are you on it? I haven't had kangaroo meat before. I never thought of them as edible before. I've always looked at them as cute animals, but never as foods. As usual you've written an excellent post. Thanks everyone for dropping by and for your comments. You are all way more adventurous than I am on the animal front it seems. @ Cjw666 - well, yes it's true if you get to know the animals personally then its harder to eat them. It's a bizarre concept I fully realise. Someone gave me the hot tip on miniature cows - so I may not need divide intervention as they would be easier to hide! Now the UK is way smaller than OZ and I bet you have more sheep and cattle than we do. It will be an issue for you too. I expect a cow or kangaroo to appear in a future short story or a Lilly of course. @ rocksnowhite - you read me well my friend. Yes, I don't eat chicken anymore as it tastes 'off' - it's all those hormones and I fear beef is much the same. To be honest there is nothing like a roast dinner so I give in every now and then. I like meat just not kangaroo and everything else anyone has mentioned. I know its not rational is it? I have tried rabbit and grasshopper but thats about the extent of it. @ Tiffany - wow you have done well. Yes, I bet you thought of Bambi with the deer did you? Same kind of issue. What was the snake like as there are a few people who have tasted snake in these comments it seems. @ The Grandpa - first, thanks for the link in your post I was truly shocked! I don't eat a lot of meat but I do eat a lot of seafood - I love tuna but I love chocolate as well but it has to be plain and no fancy fillings though. @ Not the Rockefellars - thought you might appreciate the video so that the song will never leave you he he. Roo Aid - love it! @ Barbara - you are hilarious. Spring in your step indeed. OMG I just made that cake from your latest post but realised that I didnt have enough oil and had to put butter in it but it turned out somehow - not quite like yours but I will post it on my blog soon! @ Eric - elk, buffalo, deer, rattle snake - well you are adventurous. The though of snake sends shivers down my spine. @ Pearl - well I like to see that my readers learn something - imagine the conversations you can have about kangaroos not passing gas, he he. As for never seeing a real live one well they are not quite as cute as a koala but you will have to come here for a holiday some time. Oh and after reading your post about the Thai food there are few more things I need to avoid. @ tiddles - you don't have to hide, where did you live in Oz? It's a delicacy then in Europe? @ Christine - yes, chocolate reigns supreme and if it comes to the crunch vegetables will do me. @ June - yes, you are right, the Great Barrier Reef comes first. I also realise that Australia will be affected more than other countries because of climate changes. I also understand that they have to be culled and we gain a lot from exporting them to Russia etc but I think they are going to have to regulate how they are butchered for eating purposes. We do have to change our ways but I think I will definitely just learn to live wihout meat. Red wine - it would make anything taste better, he he. @ le - see you have seen them in herds so you are right they will end up as road kill otherwise. That's interesting that because of exports its not availably domestically. Yes I always prefer to go straight to dessert - high protein low fat ones of course (NOT). @ ytsl - no I like spinach too - I don't think it's sad - we won't starve ever. @ Stefan - yes you dont have to worry about it - how long have you been a vegetarian? @ my3sons - yes, I am glad I shared that fact about kangaroos - see what you learn? @ lisleman - thanks for that link, miniature cows - love the idea. It will mean Fannie Mae will be easier to hide...one day. @ Magee - yes I think the way they are slaughtered is questionable too - very cruel. I am with you - will eat meat. @ Blue - oh Nutella - I have never tried it ever. However when my sister and her family visited from the UK I bought some for the little vegetarian 6 year old (she has just never liked meat, fish etc). Thing is, I found her hiding in bed under the covers one day eating the Nutella with chocolate all around her mouth. Very cute - she has an incredibly sweet tooth. OK, I will do more chocolate posts! @ Matt - seagull eggs - never tried those. I think I would be more inclined to try eggs than meat. What you didn't try snails? I am not ver adventurous either - I like very plain food which was hard for my ex who owned a catering company to understand. While he wanted fine dining food I was happy with steak and salad - plain hamburger no dressing or anything. We are all different thank goodness! @ Awake in Rochester - I do mainly keep to a mediterranean type diet EXCEPT I have chocolate and that doesnt really feature in it that I know of. It really suits my lifestyle but I love baking cakes and things and have to watch the carbs - comfort food. I can't even imagine eating kangaroo -- I agree it would be like eating your family pet cat or dog. Maybe I'm leaning more and more toward being a vegetarian -- yum to spinach. Thanks for visiting my blog and posting so many interesting items on yours. I'll be back! I successfully read your blog to my always-interruptive mom & aunt who I'm traveling with this weekend. My mom wants to know what kangaroos eat to keep them from belching or having gas! Where "do" their gases go? Is it because they don't vend it there in Aussieland? Because if they do, you need to go directly to the market, do not pass Go, do not collect $200.00, and buy yourself a jar. I recommend bringing a butter knife with you to the store, because you'll probably finish the jar before you get home. I'm sorry if I've introduced a topic into your life that will leave you feeling unfulfilled and dissatisfied with your present existence. I honestly do avoid that. It just never occurred to me that you wouldn't have personally tried the stuff yourself. @ Meryl - yes I love spinach too - I thin i have convined myself to cut right back on meat now after all this reading about green house gases - thanks for dropping by. @ 45 and over - I hope you are enjoying your trip and tell your Mom and Aunt hello from me. Kangaroos are herbivores so they actually eat grasses and other greenery in the same way cows may (although they get fed grains too I guess). Anyway I found this information somewhere which I thought was interesting so thanks for your question because I learnt something. "Kangaroos and cows have similar diets. So, what's different about kangaroos that prevents them from farting? It's down to the different bacteria that exist in the roo's stomach. In cows and other cud chewing livestock, feed fermenting in the stomach creates hydrogen, which can prevent the fermentation and digestion from proceeding. In the case of these animals, nature gets around it by employing the use of bacteria, which then create methane. In Kangaroos, the bacteria instead create acetate, which aids digestion. For a few years now, scientists have been working on isolating these bacteria in the hope of introducing them to cattle. Aside from the methane reduction, they also believe by achieving this, livestock could gain 10 and 15% more energy from the same amount of feed." Taken from Green Tips website. 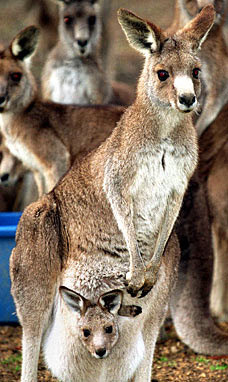 I cant even think about eating "Skippy"
I really hope that Aussies will not be eating kangaroos in the near future. And, I agree with you, in that vegetarianism is the way to go. Soy products are very tasty (I know since I eat them). I will try not to hide ok? I was born in Melbourne raised in Albury/Wodonga and travelled all around Australia many times because of my work, In Europe they start putting kangaroo on the shelf around Christmas, I guess it is expensive as there are not any kangaroo farms here, it is about 15euro a kilo double that to get the aussie dollar. @ Toraa - see we are all the same - when you grew up watching Skippy its kind of like eating your best friend. Can't do it. @ Nina - I think you should put some soy recipes up on another blog - I need some inspiration! @ Blue - No, no nutella - just cannot even contemplate it chocolate lover or not. And I have never tried it maybe because it looks like vegemite. Thanks for the mention on Le's blog re her competition. Also, Christine as mentioned you in her last post. @ Tiddles - oh I loved Albury - used to go there for work sometimes. Wow you are on the other side of the world - I lived in the UK for a while too - hope you get to come back here every now and then. @ Le - wow, nice surprise and good idea for competition. I just finished a plate of fried mashed potatoes...yes, you read that right...and I'm too stuffed to even think about eating kangaroo! Great post and wow, am I impressed that you got 40 comments on it so far!!! You deserve all the great response, Lilly. Your loyalty and encouragement of other bloggers is returning to you in spades. I know I have been immeasurably blessed by your support and comments on my blog. I have to agree with you - I can't imagine kangaroo on my plate OR in my stomach, even if the fried mashed potatoes had left any room! @ Jlo - fried potatoes? Yum. Thanks for your comment. There are so many great blogs out there and You of course are one of my favourites. I get so much inspiration from you and a lot of laughs. Anyone who reads this comment should go pay Judy a visit. I have been to Australia but didn't try kangaroo meat. The snake was ok. Probably not something I would order again. It was tough and rubbery. Not much flavor. Not bad, but not good. Anywayup...I always thought that Kangaroos were giant rabbits...and rabbits are rodents and therefore...you are being asked to eat giant rodents. I've never eaten kangaroo, but when I taught in Sweden, I was guest of honour at an event, where the main dish was reindeer. @ eastcoastlife - oh yes I jsut cannot do tofu - I have tried many times but I guess I will again given I am not eating kangaroo in he future. @ Soulmerlin - yes, I know Christina liked her chocolate and pears - I must try that given pears are in season. I love tuna but it's not the same as chocolate. Oh YOU ate Rudolph? I guess every country has their symbols - I will never be able to look at you the same way again what with Christmas coming and all - you pommy jackaroo you. Thanks Henry for making me smile always! I cant even imagine eating "Skippy" either ... but when I saw the cute baby calves on the farm and newborn lambs at the sale yards - I felt my heart tug ...till I smelt the steak cooking. *sigh* I had to force myself to eat tuna ! Trish - I know. I do like a steak every now and then and there is nothing like a BBQ either is there? But Kangaroo - no, if that is the only option in the future I will be a vegetarian. Then again by then I probably will have no teeth to chew meat anyway- he he.